By CNN'S SHEENA JONES, AMANDA WATTS, DAKIN ANDONE, SHAWN NOTTINGHAM, CHUCK JOHNSTON, KEITH ALLEN, MATTHEW HILK AND DARRAN SIMON CONTRIBUTED TO THIS REPORT. 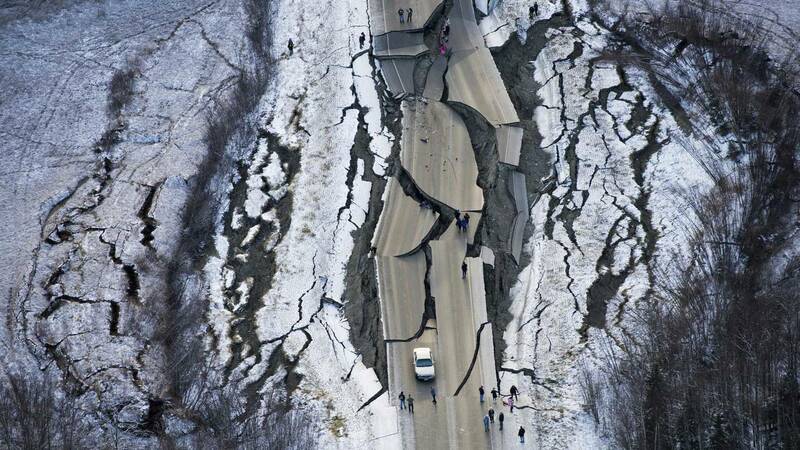 (CNN) - More than 1,000 aftershocks of magnitude 1.5 or greater have shaken Alaska since Friday's big quake knocked out power, ripped open roads and splintered buildings in Anchorage, US Geological Survey geophysicist Randy Baldwin said Sunday. Still, local officials said that life was slowly returning to normal after Friday's magnitude 7 earthquake, even as 4 to 8 inches of snow was expected Sunday. "It's interesting how things look different in the light of a new day," Anchorage Municipal Manager Bill Falsey said, adding that aftershocks have been tapering off. "Tomorrow is going to be a day closer to a normal sort of day, meaning that we're going to have a weather event," said Anchorage Mayor Ethan Berkowitz. "It's winter in Alaska." "The power is up. The heat is on. The communication lines are opening," Falsey said. "This is the second-largest earthquake we've had since 1964, which was a very significant earthquake," Berkowitz told reporters Saturday, referring to the 9.2 quake that was the most powerful recorded in US history.